Why Be Curious? 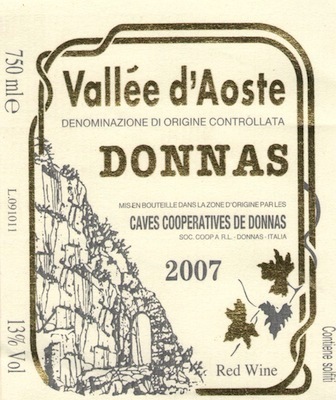 If you enjoy Barolo but are searching for more minerals and elegance than tar and muscle, then look up a 1000 foot mountain ridge to Alpine wine from the Italian-French region of Valle d’Aoste. The vines grow in terraced vineyard blocks cut from layered granite and quartz in what looks like the biggest game of shoots and ladders you have ever seen. Earthy, spicy, wiry wines; hiking boots optional. Picotendro / Nebbiolo + 10% Freisa and Neyret. Nebbiolo (locally called Picotendro) grown in this granite soil has more minerality and elegance; more nose than body. The 10% addition of Freisa and Neyret adds a wonderful sour-juicy element that makes the wine highly drinkable. Vineyards: 1300-1700 feet; terraced into the granite and quartz. Sulfur and copper in the vineyard. Hand harvested with the help of an Alpine rail system. Vinification: Selected and native yeast (depending on year); 24 months in large Slavonian oak botti; unfiltered.